In December, prepays finished the year on a positive note, falling back below 6% to record the ninth month below that level this year. As for the detail, prepayments fell 14% to 5.39% from 6.24% in November. In comparing prepayment speeds for 2012 to 2011, this year showed an increase of 2%, with this year coming in at 5.52% versus 5.41% for all of 2011. Although the increase was small, this is the first YOY increase since 2005 / 2006. As for the largest sector of the market, 20+ years to maturity, prepayment speeds fell by 21% to 4.41% from 5.56%. 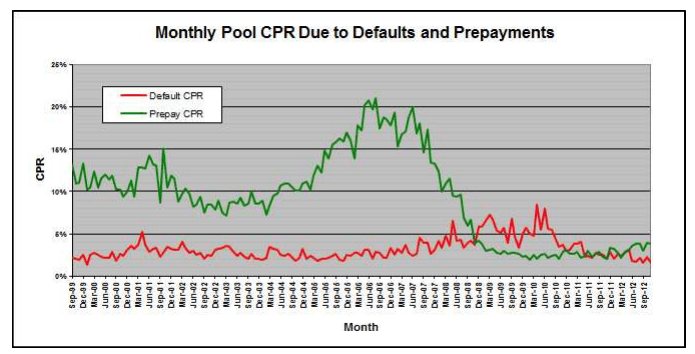 Turning to the CPR breakdown, the default CPR fell by 29% to 1.60% from 2.26% in November. This reading represents the second lowest this year and the third lowest since September 1999. Regarding voluntary prepayments, they also fell, decreasing 5% to 3.79%. With six out of the past seven months showing a voluntary prepayment speed above 3%, it looks like the days of sub-3% readings are over. As previously stated, overall speeds came in at 5.39%, a 14% decrease from November. This month continues an unbroken streak of 27 consecutive months of sub-7% prepay speeds. As for next month, preliminary data from Colson suggests a rise above 7%, as we begin 2013 with a high reading, relative to the last 2 years. While this is an unwelcome event and bears watching, it may not be a harbinger of higher prepays going forward. Historically, January is one of the highest prepayment months during theyear, with an average prepayment speed that is 4% higher than the overall average since 1999. As always, the CPR Report will keep a close watch on this situation and report back to our loyal readership with the facts. Turning to the default/voluntary prepayment breakdown, the Voluntary Prepay CPR (green line) fell to 3.79% from 3.98%, a 5% decrease. While the VCPR remained above 3%, the Default CPR (red line) decreased by 29% to 1.60% from 2.26% the previous month. While we finished 2012 on a strong note with historically low defaults, voluntary prepayments seem to be making a comeback as we enter 2013. Historically, low defaults eventually fuel higher voluntary prepayments, so this situation should be monitored by those concerned with higher overall prepayment speeds. For further information on the terminology and concepts used in this article, please refer to the “Glossary and Definitions” at the end of the report.